If you dislike the sound of someone slurping through their straw to try to get every last little drop out of their cup then you probably shouldn’t make these smoothies. My kids absolutely LOVE them! And it all started when on a recent trip to buy groceries from Earthfare we decided to also have lunch in their little cafe. While paying for our sushi I noticed that they had a surprisingly good smoothie menu, so on a whim I decided to order their PB&J smoothie for my girls (and me) to share. Well, that was a mistake…I should have gotten a large size for each of us! During the first 5 minutes of the lunch (which was as long as the smoothie lasted) all I could hear – aside from the slurping – was “I want more of it” ”it’s my turn for some” “she is drinking it all”. Need I say more? I of course don’t have Earthfare’s exact recipe so this is just my version that emulates theirs as best as I can. My daughters responded very similarly to this version so I would say it went over well. This is the best invention for kids since the original PB&J!! 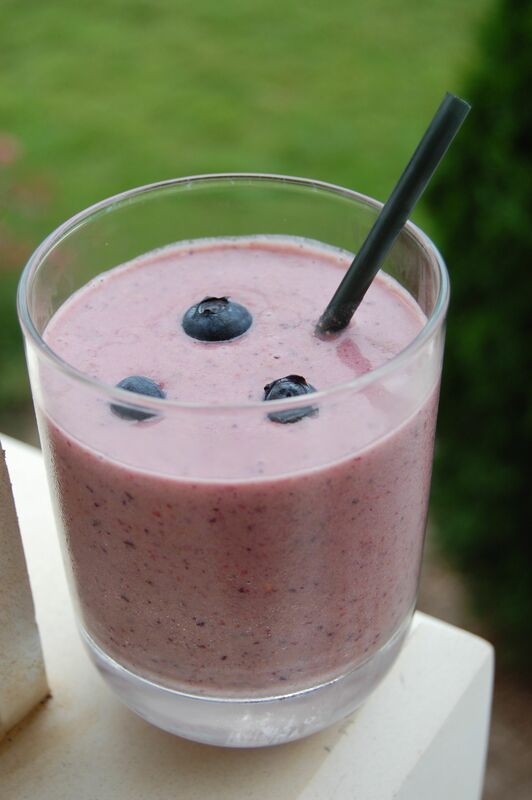 Mix well in a blender and serve cold with a straw. Made this for snack today! VERY GOOD! 3 yr old still unsure abt it, but me, my son & husband thought it was great! Thx for the recipe!